BRISTOL SHOW: A trio of new amps and Xanda speaker from Leema Acoustics | What Hi-Fi? We've already reported on the Reference amplifiers, but equally intriguing is the floorstanding Xanda speaker shown here. According to Leema, the new Xanda reference loudspeaker offers "true state-of-the-art, high-end performance coupled with stunning design and exquisite finish". Available in high-gloss finishes, Leema's latest statement design "integrates perfectly with today's modern interiors. Xanda offers new levels of soundstage focus, precision and depth; shimmering, delicate high frequencies, and unbelievable bass power control and detail". Xanda uses four Leema mid-bass drivers, a 30mm ferro-fluid cooled, soft-dome tweeter and a 25 cm aluminium long-excursion bass driver. The biwireable 3.5 way second-order Linkwitz-Riley crossover uses hand-crafted air cored inductors and "Clarity" capacitors in key locations and connects via WBT NextGen binding posts. 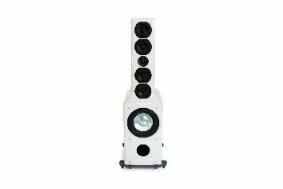 In addition to the Xanda, new versions of the Xero and Xone loudspeakers will also be on show in gloss black and white finishes. There'll also be a newly updated version of the Stream CD player.